If you own a Instant pot and want to cook meals immediately, this is the book for YOU! With wonderful recipes that are simple, easy and a variety of different meals to meet the entire needs of your family, this recipe book will do the trick. 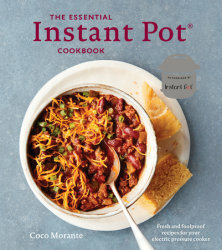 This book has some great tips and techniques to get you started on using a instantpot or will help you learn new ways of cooking if you are already an expert. I also love the amazing photos! This cookbook is a gem and I highly recommend it for those who love their insta pot. I give this book 5/5 stars. A favorable review was not required. I keep thinking about getting one of these but don't know where I would keep it. This cookbook looks necessary though for using an Instant Pot. Thanks for the review.